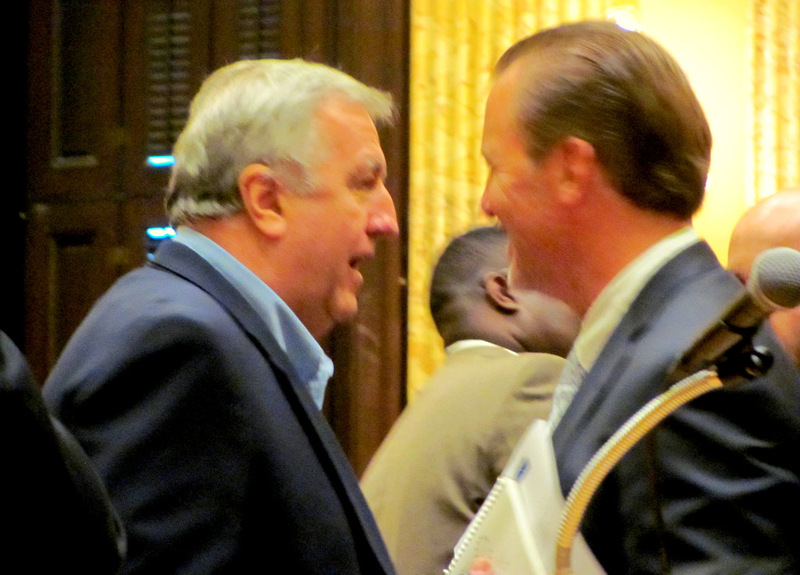 Should it be called back scratching, quid pro quo or simply business-as-usual at City Hall? Recently-released campaign reports reviewed by The Brew show that Michael Beatty, developer of Harbor Point, contributed $5,750 last year to his City Council allies – while his wife, his late father’s architecture firm, his development company and his general contractor paid $16,000 into Mayor Stephanie Rawlings-Blake’s campaign kitty. What makes this significant? The contributions came during a time when Beatty was actively pushing for approval of a $107 million TIF tax credit from the city. Neither the mayor – nor any of the City Council members who received Beatty’s cash – publicly disclosed the contributions during or after the long and heated debate over the tax financing subsidy. “He’s not spending his money on elected officials in his own jurisdiction. This indicates to me that his spending is strictly a business proposition,” said Jennifer Began-Dangel, executive director of Common Cause Maryland. On the night that he won the $107 million TIF subsidy, Michael Beatty was ushered into the mayor’s conference room for photographs with elected officials. From left: Councilman William “Pete” Welch ($500 from Harbor Point Development Group), Councilman Warren Branch ($500 from Beatty Development Group), Council President Jack Young ($2,000 from Beatty Development Group), Rod Easter, a labor leader, Michael Beatty at the podium, Mayor Stephanie Rawlings-Blake ($16,000 from Beatty and allies), Councilwoman Helen Holton, partly obscured ($250 from Beatty Development Group), and Councilwoman Rochelle “Rikki” Spector ($0). Bevan-Dangel said her good-government group has pushed for “black-out” periods where elected officials cannot solicit or receive funds from developers seeking zoning, tax or other privileges for their projects. “Unfortunately in Maryland, money buys access and developers tend to invest the heaviest in campaign contributions because they yield the best return on their investment,” she said in an interview with The Brew. Beatty’s efforts included the hiring of two politically-connected lobbyists, Ryan J. Potter and John A. Pica Jr., a former Baltimore state senator. City disclosure records show that Potter, a partner at the Gallagher, Evelius & Jones law firm, was paid $20,722 by the Beatty group to lobby the City Council on behalf of the TIF tax credit. Pica got $1,500 for his lobbying, which was limited to the final passage of the legislation. In addition, Beatty hired KO Public Affairs headed by ex-O’Malley spokesman Stephen Kearney and Damian O’Doherty, brother of former Rawlings-Blake spokesman Ryan O’Doherty. Calling itself a “strategic communications firm,” KO does not file lobbying registration and disclosure reports to Baltimore’s Ethics Board or to the Maryland Board of Elections. – $1,000 to City Council President Bernard C. “Jack” Young. – $1,000 to 1st District Councilman James B. Kraft (whose district includes the Harbor Point site). – $500 to 10th District Councilman Edward Reisinger ($500 was also contributed by Stephen Kearney). – $500 to 13th District Councilman Warren Branch. – $250 to 7th District Councilman Nick Mosby. – $250 to 11th District Councilman William H. Cole IV. 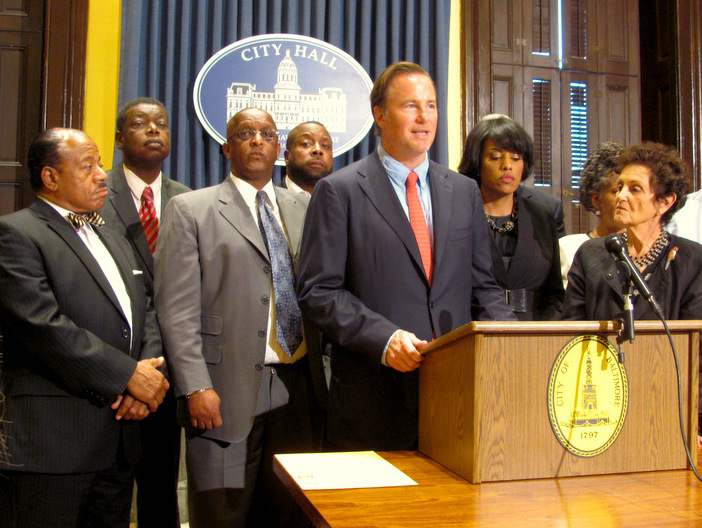 • On March 28, 2013, during a closed voting session, the Baltimore Development Corp. (BDC) recommended to the mayor $107 million in tax credit finance bonds to pay for public infrastructure at Beatty’s proposed waterfront complex. – $4,000 from Beatty, Harvey, Coco, Beatty’s late father’s New York architecture firm, which is listed as the “architect of record” of Harbor Point. – $4,000 from Armada Hoffler, listed as general contractor of Harbor Point. The Virginia-based contractor constructed all of the buildings in Harbor East, which was developed by Beatty and H&S bakery mogul John Paterakis. – $4,000 from Beatty Development Group, owned by Michael Beatty after he split from Paterakis. • On April 29, lobbyist Ryan Potter contributed $1,000 to Rawlings-Blake campaign. • On June 3, Mayor Rawlings-Blake announced the introduction of legislation in the City Council that would establish a special taxing district for Harbor Point and create a special fund to divert property tax revenues from the treasury to the payment of city TIF bonds to build streets, parks and other infrastructure at Harbor Point. • On June 6, Mayor Rawlings-Blake, Council President Young, BDC President Brenda McKenzie and others hold a press conference with developer Beatty. The mayor lauded the job creation and other benefits of the $1 billion development anchored by the proposed Exelon Tower. KO Public Affairs coordinated the visuals and message by Beatty and others. • On June 15, Beatty contributed $250 to 8th District Councilwoman Helen Holton, chair of the Budget and Appropriations Committee. • In July, two public hearings before the Taxation Committee give voice to critics of the TIF tax deal and calls for a “giveback” by Beatty to low-income Perkins Home public housing residents near the site. • On August 7, Councilmen Reisinger, Branch and Cole, forming a majority of the Taxation Committee, override Stokes and vote to move the TIF bill out of committee. Stokes stormed out of the room in protest of his committee being “hijacked” by pro-Beatty forces. • On August 12, the full Council suspended its rules and votes to approve the TIF subsidy on second reader without the written approval of Committee Chairman Stokes. The vote is 12 in favor, two opposed (Stokes and 6th District Councilwoman Sharon Green Middleton) and one abstention (14th District Councilwoman Mary Pat Clarke). • On September 9, the full Council approved the $107 million Harbor Point TIF. Beatty joins Rawlings-Blake and other Council supporters for a press conference in the mayor’s offices. • On September 19, 9th District Councilman William “Pete” Welch reported a $500 campaign contribution from Harbor Point Development Group, a wholly-owned subsidiary of the Beatty group. • On November 15, Second District Councilman Brandon S. Scott reported a $500 campaign contribution from Harbor Point Development Group. • On December 2, Council President Jack Young reported a $1,000 contribution from Beatty Development Group. • On January 8, Young and Rawlings-Blake give final approval of the $107 million TIF credit as members of the Board of Estimates. 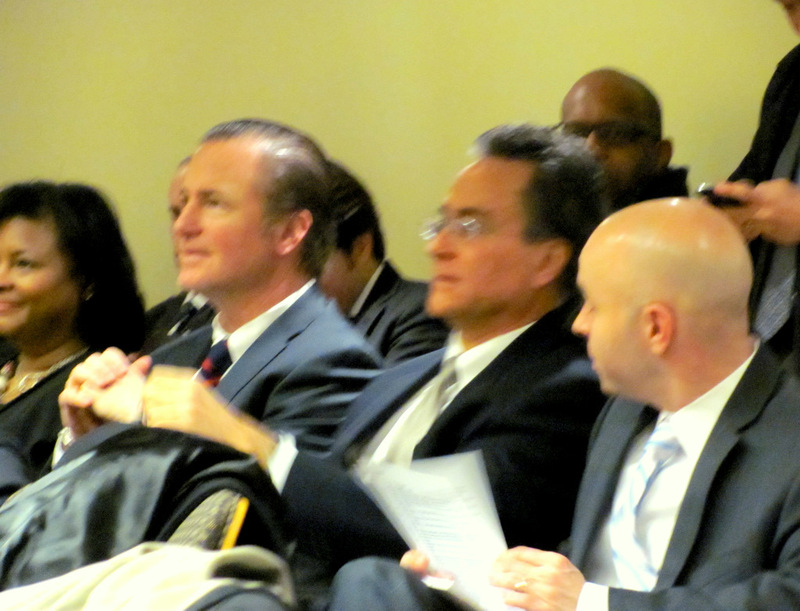 The panel’s third elected official, Comptroller Joan Pratt, votes against the deal, saying she needs more information. (Pratt’s campaign committee did not report any Beatty donations in 2013).